I have a sneaky feeling the above verses in Psalms 37 have been taken at face value on more than one occasion. I can’t ever remembering if I have or not but I know I’ve come very close more than once. 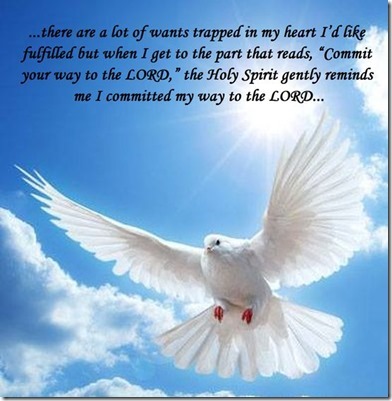 After all it is pretty tempting and there are a lot of wants trapped in my heart I’d like fulfilled but when I get to the part that reads, “Commit your way to the LORD,” the Holy Spirit gently reminds me I committed my way to the LORD over 40 years ago. And somehow my love and commitment to Jesus squeezes my wants out of my heart. I have no idea what lies on your heart today but I do know if you’ve anchored your heart in God’s heart then the desires of Jesus’ heart will be pumped into your heart. One way I’ve discovered to check and make sure the desires of your heart come from Jesus’ heart is to pray with all sincerity, “LORD, not my will but your will be done in my life,” and MEAN IT! “And (in the LORD’s time) He shall bring it to pass.” You have His promise it WILL come to pass (but don’t hold your breath because His heart beats to a different beat than yours). God is in the business of not only fixing troubled hearts but filling them with blessings as well! Who and what’s in your heart?